Last Friday, on World Elder Abuse Awareness Day, our office made an important announcement: we launched a new unit focused on protecting older Vermonters. It’s called the Elder Protection Initiative, or EPI. The EPI has roots in a listening tour the Attorney General’s Office just completed. Throughout April and May, to better understand the unique challenges that older Vermonters face, a team from our Office visited each Vermont county, listening to older Vermonters and organizations that serve them. We shared meals in tight-knit communities, went on Meals on Wheels delivery routes, and shared in the varieties of joys and anguish that our elders are experiencing. We listened. We learned. And after meeting with dozens of older Vermonters and over 230 representatives of 65 organizations, we want to help. 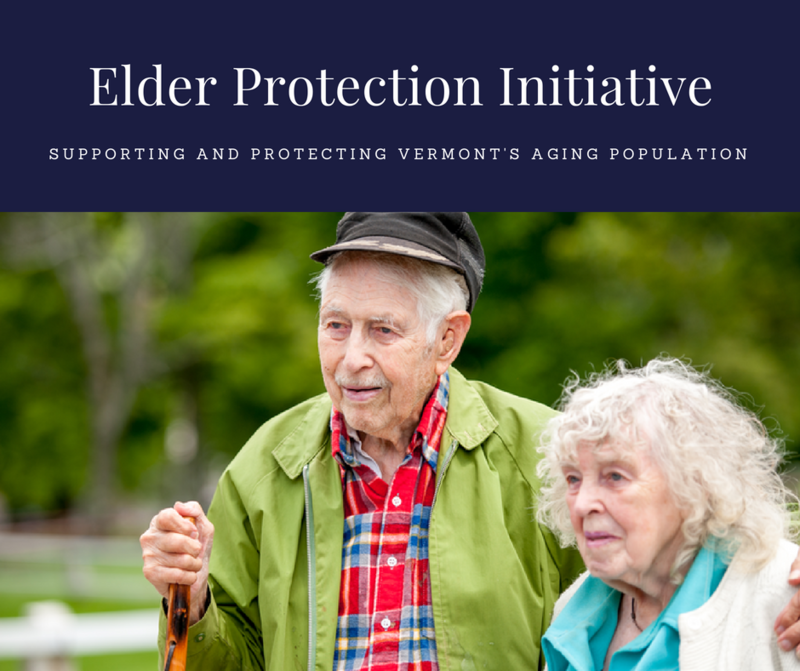 To help older Vermonters and those who serve them, our office established the Elder Protection Initiative described above. As the EPI embarks on its work, it will continue to listen and stay informed about issues facing older Vermonters. Already, the EPI has worked with Vermont 2-1-1 to address one of the most common concerns heard on the listening tour—difficulty accessing information and resources on programs and services that are available to older Vermonters (and their caretakers) where they live, from transportation to food delivery services (like Meals on Wheels). Vermont 2-1-1 maintains a 24/7 hotline and a website that provides just this information. To access this free information, dial 2-1-1 or visit vermont211.org. The Executive Director of 2-1-1, MaryEllen Mendl explains, “The 2-1-1 statewide system has been built over the course of the last 13 years for a public-private partnership between United Ways of Vermont and state government. Allowing for a quality-driven platform for the delivery of professional information and referral, and a database containing thousands of community resources.” 2-1-1 is also committed to enhancing its capacity to assist callers with concerns specific to elder abuse and exploitation. Thank you, Vermont 2-1-1, for this outstanding commitment to Vermont’s elders! We look forward to seeing this collaboration flourish and many more develop as we work to support the needs of Vermont’s aging population. The initiative has just started its efforts in support of Vermonters. There are more developments and solutions that will come out of this group’s work. 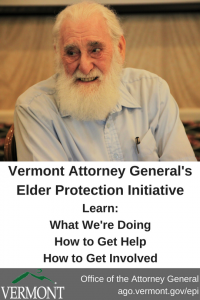 To stay connected, check in regularly on the Elder Protection Initiative page on the Vermont Attorney General’s Office website. This entry was posted in Elder Protection Initiative and tagged access to healthcare, connection, dementia, elder, enforcement, food insecurity, government, isolation, lack of transportation, legislation, listening tour, nongovernement, protection, public education, resources, Senior, Vermont 2-1-1, Vermont 211, Vermont211 by Crystal Baldwin. Bookmark the permalink.